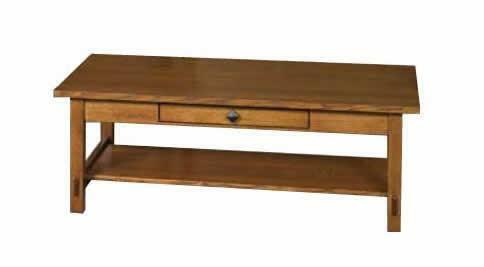 Although with its simple, clean, functional design, solid wood construction, and exposed tenons, our Amish Lucern Coffee Table is considered mission style, it's clean lines allow it to pair well with a variety of furniture styles. Along with a 1-inch thick rectangular table, this table is built standard with a dovetailed, full-inset drawer, angled legs, and open design that offers a shelf base for everything from rolled up blankets to magazines to extra remote, and a black diamond-shaped pull. Customize the Lucern by selecting the wood type, finish, and hardware of your choice.